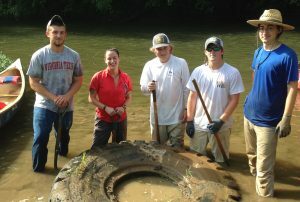 We are looking for young adults, 18 years of age, to provide eco-assessment and stream cleaning services in Culpeper and Fauquier counties on the Rappahannock River during June, July and August. Employees will receive paid training in eco-assessment protocol, basic field first aid, GPS data entry, mapping skills and business entrepreneurship. We are looking for prompt and team oriented individuals. Must have transportation and be comfortable in and around moving water and enjoy outdoor challenges. Previous canoeing/boating experience preferred. Must be able to lift 50 pounds daily. Please send an email to debbie@naturalcapital.us detailing your interest and qualifications to be part of our team. Salary $10 hour. Learn more about StreamSweepers at www.streamsweepers.org or by calling Debbie Manzari, Program Manager, at (540) 672-2542. In 2017 our Sweepers will continue working Virginia’s rivers by addressing the upper Rappahannock in three counties: Rappahannock, Fauquier and Culpeper. We will begin at Route 29/15 near Remington and continue to the confluence with the Rapidan. In 2018 we will begin at the headwaters and work our way back down to Route 29/15. We also need some additional financial support as we have a gap of about $9,000 we would like to cover. We appreciate contributions of any amount which can be made via our secure website below. We will expand our service area to Southwest Virginia and the Clinch River, home to Virginia’s newest designated State Park. The Project Manager will be responsible for on-water management of seasonal staff to complete ecological assessment and cleanup of rivers as well as general project coordination: outreach to landowners for river access, report writing and training of seasonal staff. Brian and Stanley Morris from Greene County will be working with StreamSweepers to soon begin removal of large debris items from the Robinson, Rapidan, and Hughes Rivers. More information as this project progresses here and at StreamSweepers on Facebook. We’ve reached our goal for Adopt A Pile of $10,000 – Thanks for your support! This summer we have uncovered over 25 sites with trash too large to be floated out on our canoes in the three rivers we cleaned (Hughes, Rapidan and Robinson Rivers). We are going to need to hire contractors with heavy equipment to remove these items. This additional expense was not included in our budget. Our Sweepers did a great job this summer and they really don’t like leaving anything behind. 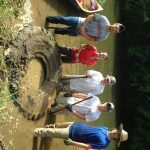 Please consider a donation to fund the removal of these large items – culverts, extra heavy tires, diesel storage tank, dangerous metal objects and more. We estimate the total cost to remove these items to be $20,000 with $10,000 of this amount provided through pro-bono (match) services by our contractors. You can make a general donation, or you can “Adopt” a specific site by clicking and donating from that image or by using the secure donation link below. Some of this stuff has been in our rivers for decades, rusting, and leaking oil and other substances. It’s time to get it out. Thanks for making our rivers safe for our friends, family members, visitors, and of course wildlife. Last week, the Orange County Review covered StreamSweeper’s 2016 season and the continued dumping into our rivers. The article focused on dumping of tires and household junk (mattresses, dresser, television, etc.) since the river was cleaned just 2 years ago. The article also highlighted the remaining trash sites too large to be floated out with canoes. To learn more about our efforts to remove these large trash sites, click here. Our fleet has expanded by one boat, thanks to the generosity of Joe Pipik. Soon this newly donated boat will have the StreamSweeper logo stenciled on it along with it’s name “Cuyahoga”, in honor of Joe and the river he’s spent time canoeing on. Many thanks Joe, we will put this boat to good use and think of you as we go about our work!